Very tasty and so simple to make! Bruschetta is one of those foods that instantly puts me in a good mood and transports me back to so many summers spent in Italy over the course of my life! Basic Bruschetta is simply barbecued bread slices rubbed with whole cloves of garlic and served with a drizzle of olive oil and a pinch of salt. It couldn’t be simpler. 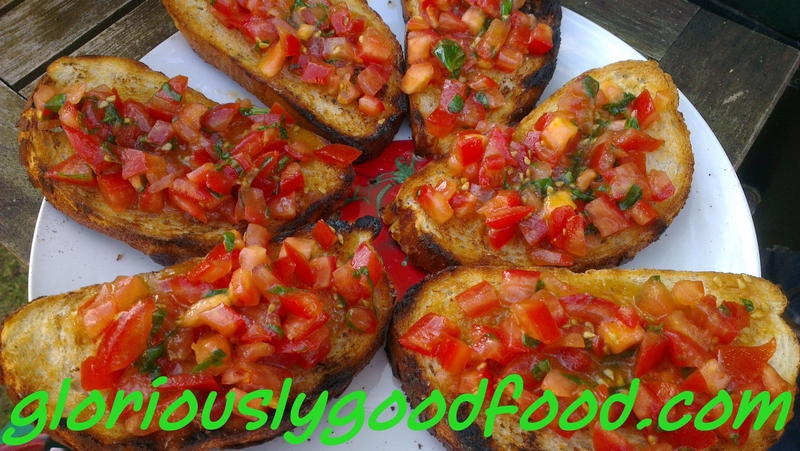 The picture above shows a very common variation: Tomato Bruschetta. Chop the tomatoes into small pieces and place into a bowl, along with a generous amount of roughly chopped basil leaves. Add a very generous amount of extra virgin olive oil (you will need plenty of juices to soak into the bread) and season with salt, to taste. Leave to stand until needed (try to make this at least 15 mins before you toast/barbecue your bread slices). Slice the bread into thick (about 2cm thick) slices and toast on a barbecue or under a grill (barbecued tastes nicer!). Once the bread slices are toasted, rub a raw peeled garlic clove over each slice (how much you rub on depends on how strong you want the garlic flavour to be!) and immediately top with a generous amount of the previously seasoned tomatoes, ensuring each slice of bread gets plenty of tomato/olive oil ‘juice’. Serve immediately before the bread goes too soggy! Bruschetta | Gloriously Simple, Gloriously Good!